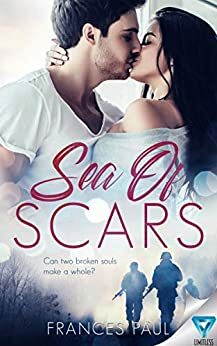 5.0 out of 5 starsFrances Paul did an amazing job with Sea Of Scars. Frances Paul did a wonderful job with this book. I am new to Frances’ writing, but after reading this book, I will most definitely read more!!!! The characters and the storyline was really amazing!!!! Very vivid, very detailed!!!! This is not a book for the faint of heart or those that may have triggers to certain situations so please read with caution. Zachary is former military and is having challenges dealing with being back with his family after serving. Courtney is a woman dealing with a marriage that has become difficult. Each one is diligently working towards creating a better life. When their paths intersect, they learn more from each other than they thought possible with one caveat. Ms. Paul has written a stunningly beautiful, heart wrenching story that reads true to life. Make sure to have tissues handy. I volunteered to read an advance copy of this book and all opinions are my own. 5.0 out of 5 starsBrilliant 5+ stars read!! I am in awe of this exceptionally talented author!! This is a beautifully written story which has a fantastic and detailed plot with complex and broken characters. The moral of this story is don’t let the past define you, live life to the fullest each day! This story is an emotional roller coaster ride, and is heartbreaking, intriguing and with surprises and love. I was totally captivated throughout this addictive page turner, and I cannot wait to read more of this authors’ work, which I highly recommend for all readers. 4.0 out of 5 starsHeartbreakingly Good Read!! I got this book as an ARC for an honest review and this is my first book I have read by the author. This is definitely a very emotional book for sure! Be sure to have tissues on hand when reading this one. It was a heartbreakingly beautiful story. It took me sometime to get into as I personally had some issues with the heroine but I got why she did the things that she did. Now as for the hero, Zachary, he broke me. His issues are sadly real issues in life and it is hard to even imagine that. But it warmed my heart how he turned out in the end of the book. This book was heartbreaking and beautiful. I was hooked from the beginning and I couldn’t put it down. A Must Read.